Keep in a white (or as light a color as you can find like light beige) ceramic pot with drain holes. Darker colors will allow the sun to heat up the pot too much and cook the roots, killing the plant. A good sized pot is a 14-16 inch diameter pot. 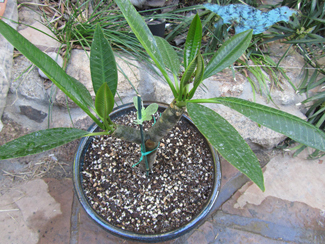 Plant the plumeria at the same depth in the new pot as it was in the smaller pot. Prepare the soil mix by mixing 1/3 Perlite or pumice, 1/3 sand and 1/3 Potting soil. You can add a pinch of bone meal and soil sulphur to the mix. These aid in adding a low grade organic fertilizer to the soil and sulphur has antifungal properties which help prevent rot. If you desire even more drainage you may add additional Perlite or pumice. We also recommended is using a prepackaged Cactus Soil. We use "Super Soil" brand in the red bag marked "Cactus & Palm Soil". 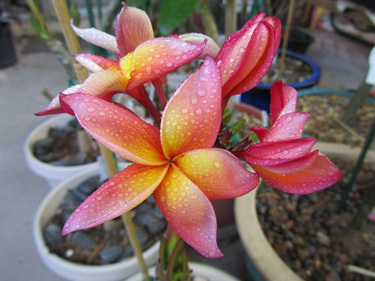 It has the correct mix of ingredients for rooted plants or for rooting Plumeria cuttings. 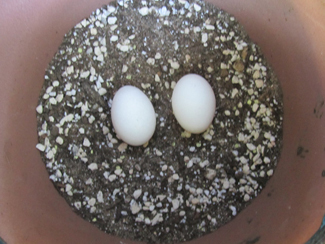 We recommend using the "Egg Method" which involves the use of which uses the same planting techniques stated above and adds the additional step of placing a raw uncracked egg in the pot approximately 1" below the bottom on the end of the cutting. We have found this method helps increase early root development of freshly planted cuttings. 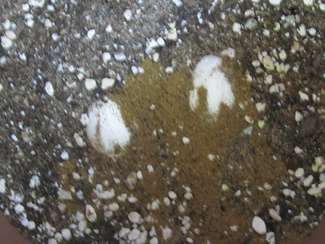 This is due to the nutrients that are released from the fermenting egg. 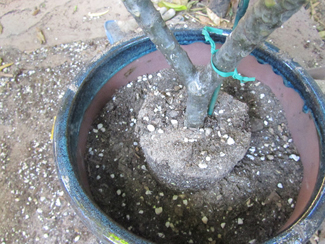 (Below are pictures of how to plant a plumeria using this method). The Egg Method is based on the anaerobically fermenting process of eggs and probiotics, which benefits plants tremendously. It has been used in agriculture production for many years. 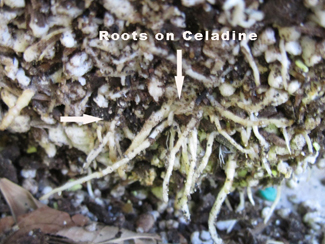 The pictures below show the existing roots of a rooted Celadine Plumeria that we repotted using the egg method. Pictured to right is our freshly repotted plumeria plant which was planted using the egg method. This plant grew vigorously all summer long and produced a blooming inflorescence while rooting. In the summer, when our temperatures exceed well over 100 F, on daily basis it is best keep your plumeria on a covered patio, on the east side or south side of your house. Place it near the edge of the patio so that it gets lots of indirect light, but is shielded from direct sun overhead. In the middle of summer, an east facing patio will give the plant direct sun before noon and a south facing patio puts the plant in the shade all day, because the sun is so high. If your plumeria continues to burn from the sun, not just during transition to a lighter spot, move it deeper into the patio to give it more shade. In mid summer, flowers will last longer in the shade as well. In the winter when the plant is dormant water it once a month or even less than that. Just spray a little water on the surface to dampen the soil. Do not soak it. When the plant begins to show that it is emerging from dormacy usually in early spring the tip becomes a shiny green color. Once the claws begin to emerge you can begin to water and fertilizer your plants. During the growing season use a fertilizer high in phosphorus (P) and potasium (K). Miracle Grow Bloom Booster 10-50-10 which has a high,(NPK middle number), is fine but I like Alaska Fish even better. If you used a grandular fertilizer the phosphous content should not exceed 20%.